Though Instagram has backpedaled a bit on whether or not it will sell your Instagram photos to advertisers, people are generally wary to trust a company backed by Facebook when it comes to privacy. 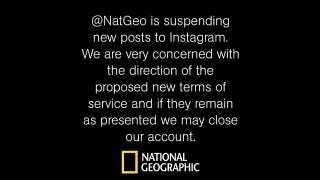 National Geographic, a company who has a real reason to be sorta ticked off at all this since its pictures are actually good, has decided to suspend posts to Instagram. Hopefully more big name Instagram accounts follow suit. Or maybe you'll close down your Instagram account in solidarity. Either way, as word spreads of Instagram's changes, the more unhappy the mob gets and the better chance for new good change (as opposed to the new bad change). That's the hope anyway.